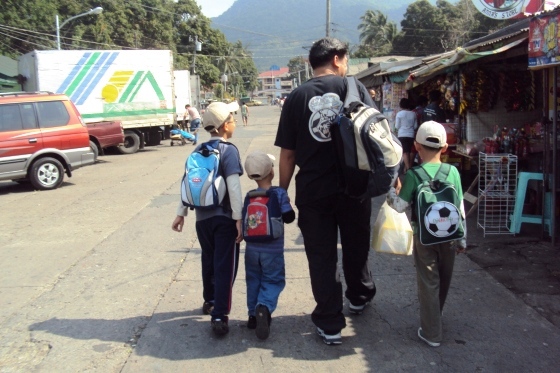 Each with his traveling backpack to carry, husband, the three boys, and I left home to board a Lipa-bound bus at Cubao. Along the way, the kids kept on asking for our itinerary. Husband let them read a Mt. Maculot info he printed from his research. Still, that didn’t stop the kids from asking questions. With less than two dozens on board the Cubao-Lipa Philtranco bus in front of Alimall, we left Manila to start our Mt. Maculot journey. In one bus stop, vendors would climb the bus to sell snacks and drinks. My three eager boys would loudly utter “uy donut!” or “wow hotdog.” This left me with no choice but to pay for the snacks and even chase the Mister Donut man to buy a box of his product. Bus Fare is P135 each. Climbing Mt. 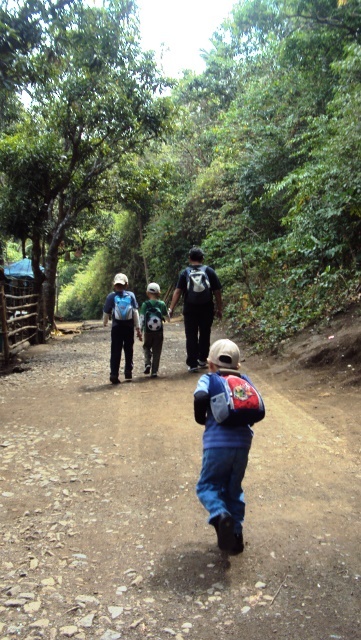 Maculot with our Traveling Backpack| From the barangay entrance, one could readily see the peak of Mt. Maculot. 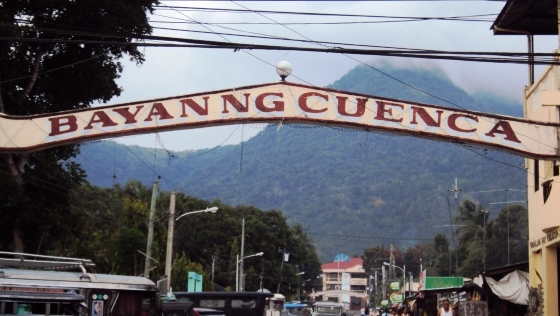 We arrived at Lipa in Batangas, took a jeep going to Lemery and alighted at Barangay Cuenca. From the arc, the scenic view of Mt. Maculot was an instant attraction and provided an enthusiastic push for us to begin the hike. Ain’t no mountain high enough/ Looking for a place to eat. We ate at a local carinderia and tasted one of the most refreshing sago drinks ever. After, we hired a tricycle to take us to the jump off point. The tricycle driver detoured us to the barangay outpost to register. Husband wrote our names, ages and contact details. He likewise paid P20 pesos per head. While waiting for husband, the tricycle driver explained to us that the registration is mandatory. Once, there was a mountaineer trapped from a tree branch and the people from the registration table were the same peeps who rescued the poor man. Climbing Mt. Maculot with our Traveling Backpack Mt. Maculot to residents is but an ordinary everyday background. At the start, bunso did a lot of catching up. We all thought he would never make it. But he proved us wrong. Said to be one of the highest and most prominent peaks in the province, Mt. 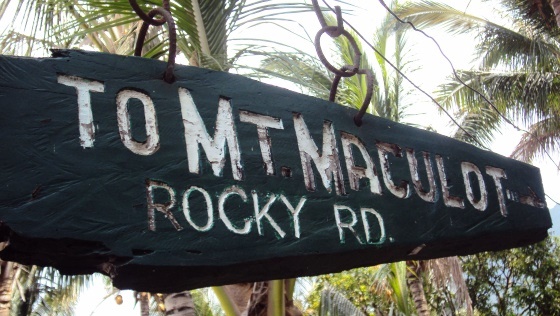 Maculot is a favorite hiking haven for mountaineers. It is also defined as a good training ground for starters. It might be the reason then that husband preferred Mt. Maculot over Mt. Makiling, another famous destination during Holy Week. With him on that climb were four individuals who never had any hiking experience; two even have asthma. 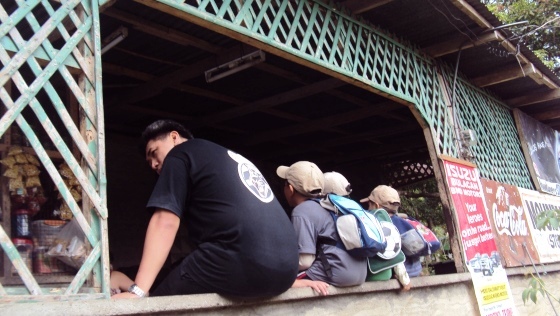 Before the climb, we prayed first asking the Lord for guidance and safety. We started our trek and looked for walking sticks that would help our ascend. And before we could reach the foot of Mt. 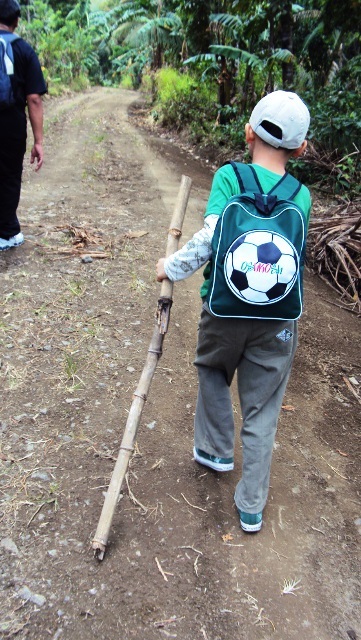 Maculot, each had his walking stick. Second son and his rather too big walking stick. Too big and heavy that he dragged it instead. Firstborn seemed like skiing with two sticks on hand. There were directional signs and from time to time, we would bump into locals going up or down the mountain. We’ve learned that these were vendors with makeshift stalls selling buco juice, candies, and chips. These stalls were made of bamboo and behind each stall were makeshift benches also made of bamboo. We rested for few minutes in each makeshift bench, devoured on our jelly ace baon and wiped off dirt and sweat. A makeshift stall offering refreshments and some chips. That I will forever teach my kids. It saddened me though to see so many snack wrappers, disposable cups, and cigarette buds scattered everywhere. Mt. 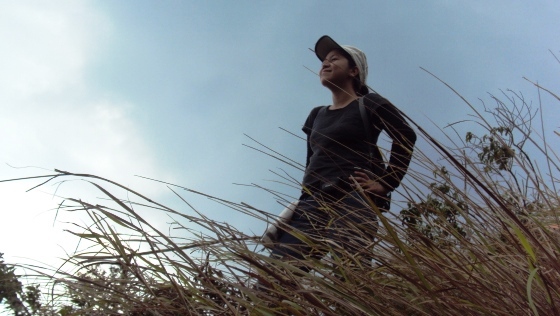 Maculot let these explorers study her and yet some of these adventurists did not give due respect to mother nature. How insensitive others may be. From our second stop, we met a group of young hikers. 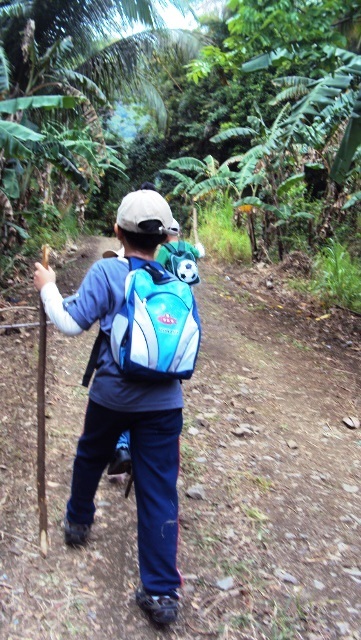 This inspired our bunso to go on and even encouraged us to minimize the ‘sitting’ and ‘resting’ and instead start ‘hiking.’ The new group would, from time to time, help us carry a boy or two upon our ascend. They became our mountain buddies. A few candies were shared. We also exchanged a dozen of encouraging smiles. And a number of praises and admiration were said towards the boys, particularly to bunso. Sharing a seat with fellow hikers. Everything seems to be easy with bunso. His kuyas as well were just as amazing. 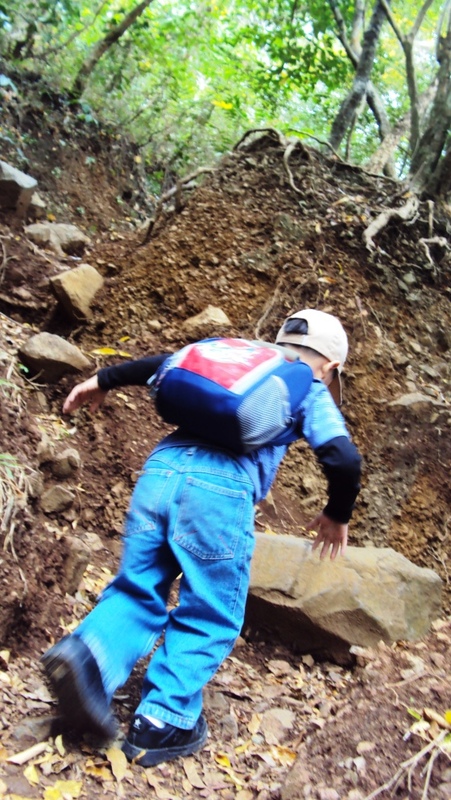 “Hold on to the branches,” “Hold tightly to the rock,” “Slide when in doubt” were a few of the surprising words we heard from our eight- and seven-year-old boys. 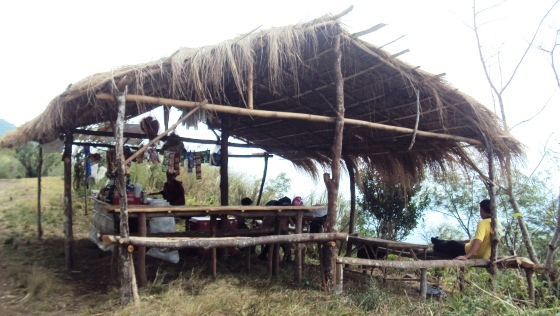 A makeshift shed for mountaineers to rest for a while. But one needs to buy food for goodwill. A 1.5-liter coke cost PhP 105. 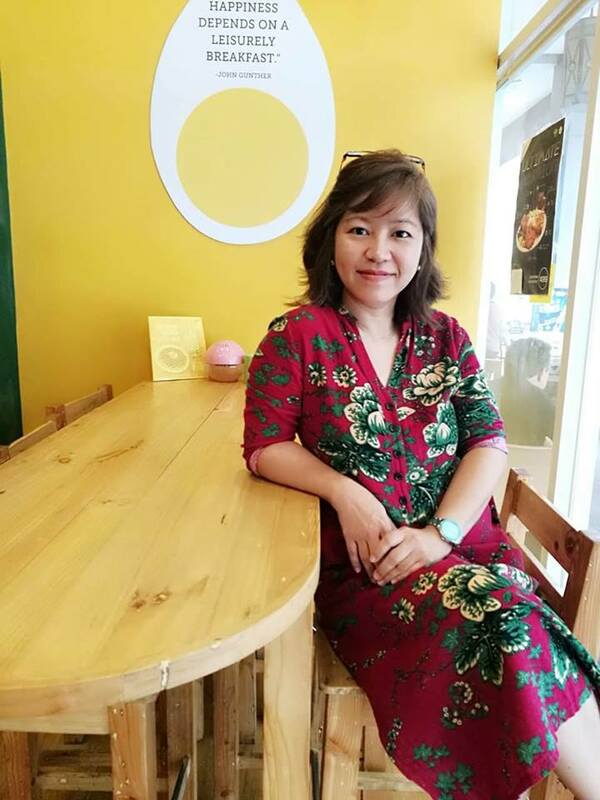 A cup of halo-halo was offered at PhP 25.00. Hard-boiled egg and a cup of rice were at Php 10 each. We ordered salted eggs (PhP 20 each) for lunch. With a glass full of ice, the 105-peso drink was a good buy. 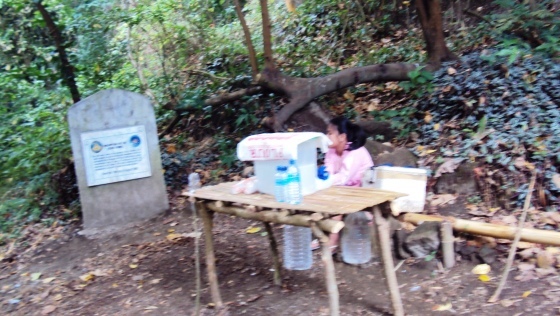 Plus, these vendors likewise climbed to bring these refreshments on top of the mountain. Tagaytay is famous for its breathtaking views of Taal Volcano, which lies in the middle of a calm lake. But Taal Volcano is located in Batangas and not in Tagaytay. 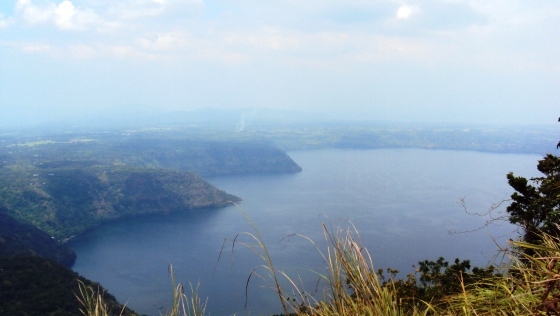 Once on top, we were rewarded with such a beautiful view of the Taal Lake. The city of Batangas and the sea that separates Mindoro from Luzon were also a few of the unobstructed views that we’ve seen. We’ve learned to appreciate small things also like the jelly ace and chocolate bars. Now, I label them as trekking food essentials. A makeshift toilet was also set up at the campsite. A canvas was used to make up the four walls and a deep hole served as the toilet. At Php 5.00, anyone can use the toilet. Curiosity led me to investigate what was inside. The sight and smell disgusted me. These locals made a big hole, maybe about six feet long, where anybody can release nature’s untimely calling. From the hole, I could see several soft drink plastic containers. About three to four big and too noisy houseflies surrounded the hole as well. There was no water container inside. The sight of the makeshift toilet was what affected me most. Even if these locals were too accommodating to let us rest for a while in their shed, still I hate them for providing a substitute comfort room because that toilet wasn’t a comfortable one and second, it will never be temporary. It poisons the mountain. Husband told us it was time to say good bye to the mountain. The boys bid their farewells. “Goodbye mountain,” they chorused. It was a touching scene. Even just for a few hours, Mt. 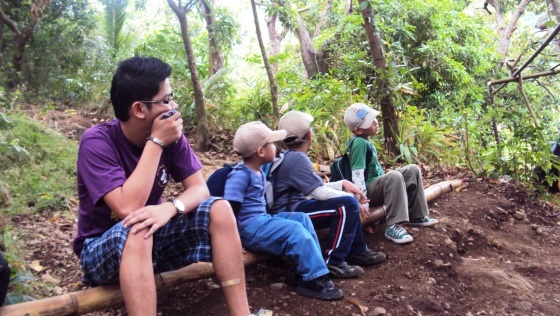 Maculot has been a good friend and teacher to my boys; taught them about the trees and rocks, the bugs and the wind. Mt. Maculot let my kids experience freedom. The trek down was rather steep and more difficult. This time, I saw a little uncertainty from bunso. During our ascend, second son and bunso were my buddies. Husband, on the other hand, was in charge of firstborn. This time, I requested husband to look after our bunso while I take care of second son and firstborn. 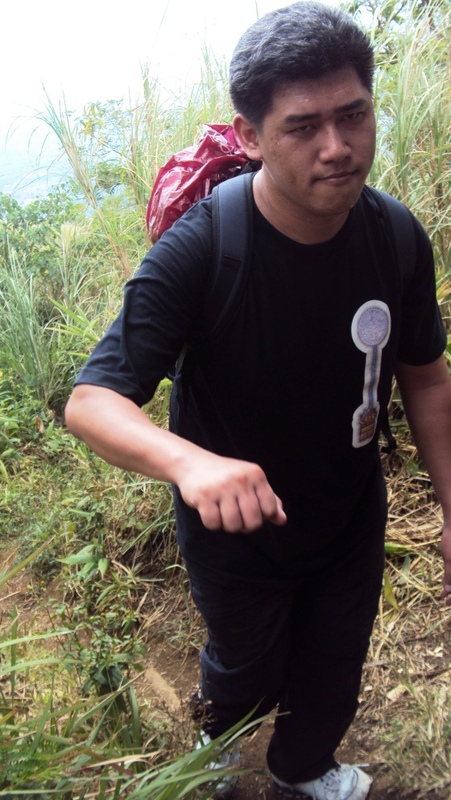 As usual, second son can manage by himself, often leading the way, either going up or down the mountain. We were again, at the foot of Mt. Maculot. The sentimental in me would like to bring home my walking stick. But I have realized it might be of great help to other so I left it instead at the “this way to Mt. 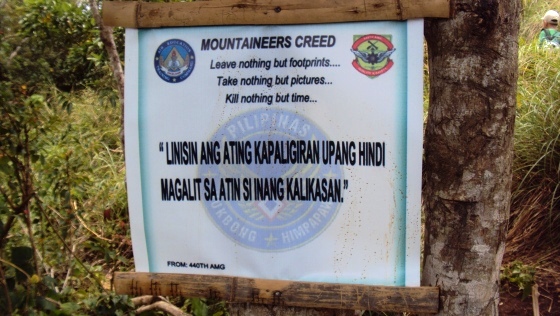 Maculot” signage where for sure other hikers would stop for picture-taking. It will surely be of service to another soul. We stopped by at Mountaineer’s Stop over and Store. We had halo-halo to pep up our tired souls. The store likewise offered shower rooms and souvenir t-shirts. Waiting for our halo-halo. The halu-halo though lacks sugar and milk. On our way back to Manila, we took the Jam Transit bus from Lemery and got off at Kamias. As usual, Jollibee was a delightful sight to the boys. Though sleepy, they each managed to finish a two-piece burger steak and a large glass of drinks. Waiting for a bus to bring us home. For those who would like to try Mt. Maculot, summer is the best time to discover this mountain. Way up and down tends to be very slippery during the rainy season. Light yet long sleeves is a must to protect one’s skin from the sun’s rays. I used an arm warmer (PhP170 at SM department store) which is rather convenient. I could take it off whenever I want during the trek. The next morning, my legs ached. What did I get then from climbing Mt. Maculot? Was it worth all? Maybe it was the rare moment to let the wind blow against my face, whipping through my pony-tailed hair while standing on top of a mountain and where everything from below looked too small. I felt freedom. Being the last to reach the top does not mean he is one loser. He let his loved ones reach first because their triumph is his as well. From firstborn’s statement “Ang galing ni Bunso, nasa taas na agad sya” only confirmed husband’s hunch that his eight-year-old boy will be a humble citizen, thus likewise taught this father humility. The boys kept their trashes inside our plastic bag. They never picked flowers or leaves. They held on stones and branches with respect. I believe, husband and I have taught the kids the proper way to respect nature as well as their fellowmen. Our hike somehow gave me a chance to commune with nature and experience even just a few hours of PEACE. It was also the very few seconds that I saw my three boys lovingly adore the lake of Taal Volcano while being so high up and the wind embracing their little bodies. From then on, I am confident that the three will live independently but will always know they have brothers to share the highs and lows of life. 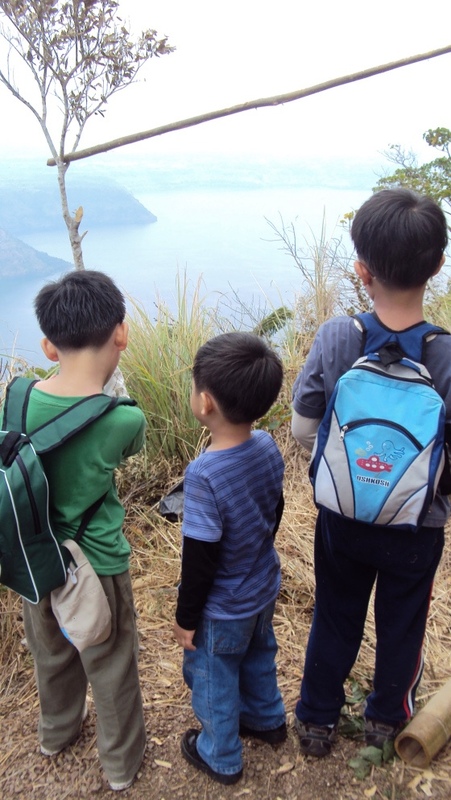 The mother’s view of her three boys overlooking the splendid Taal Lake and its volcano. My boys have experienced the wilderness. They have uncovered the mountain’s mystery. They saw bugs and insects of different shapes, sizes, and colors. The kids smelled flowers and plants of various kind. They swung on a tree branch. They met locals and foreigners. I know they will never be fooled by anyone. Many times the boys and even this mother would slide down from the trail, but we have managed to reach the top. As we made our descend, flashbacks of our hike up played on my mind – the steep trail, the edgy rocks. We survived them all. And I felt so alive. We are all alive and life is beautiful. 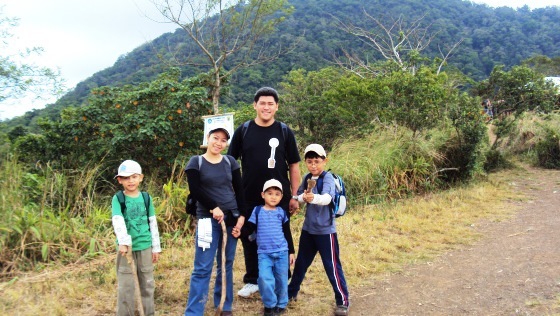 A husband, a mother, and their three beautiful boys have conquered Mt.Maculot on a Holy Wednesday. 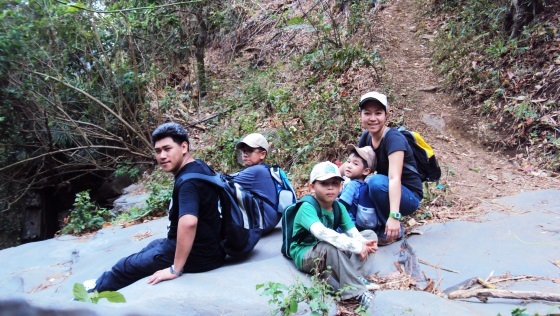 Should be given a chance to hike again, I will join husband and still bring with us the boys. Why? 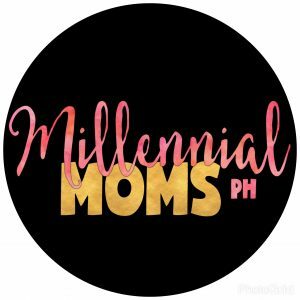 Because Mount Maculot has taught our three little kids the value of patience, the love for nature, the moment to be alone, and the importance of a family being together. And yes, the hike was worth the effort and time. Good thing big rocks are a plenty and man has invented self-timer cameras. My first and last climb with the boys was April 20, 2011. The boys still climb every Holy Week with husband’s Mapua and Filinvest friends. This year, though, I doubt if I could join them again as I have a six-month-old boy to look after. Anyway, I know that with or without their mama, the lessons learned from each climb will still be the same. Ehehe. Yes. Next is visit Berlin. Haha. Wow! Truly inspiring. I wonder if we can do this while babywearing. But I’d love to do this with my son when he’s bigger. 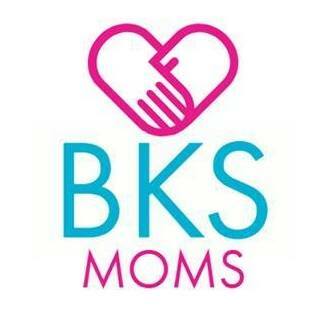 Yes, I’ve seen a babywearing momma. She and her husband have an outdoor kind of back carrier. It seems pretty cool to trek while babywearing but extra caution is needed. This Holy Week, for sure marami Na namang aakyat. If you will, Ingat. And bring water with you and some jelly ace. Super agree. Surely they will learn something positive from the experience. Looks like great family adventure! I hope to havr one too someday.It’s been a long while since I went hiking! HOw super nice! I want to go to with the kids. I’ve been there once, slept there actually. It was my first and only mountain experience haha. Do they have guides? Kasi I don’t remember the trail anymore and my husband isn’t outdoorsy. What a nice view! If kids can do it, I can too yay! We are again doing some sort of a climb though this will be easier and at the end of the hike, water falls! embrace us, when we are there Pangil Falls (in not sure if that is really the name) but wish us well. I will have more photo to capture moments. Good luck and safe climb. Bring us photos. We truly had fun there. And yes, you were right. The kids have a lot of energy. They could climb faster and even laugh at the same time without feeling pained and thirsty. hahaha. Some of my friends said that Mt. Maculot is not that easy to climb so I am very impressed that your kids were able to conquer it. Personally, I haven’t been, though I do want to go. But maybe when the weather is good, it’s been raining lately. 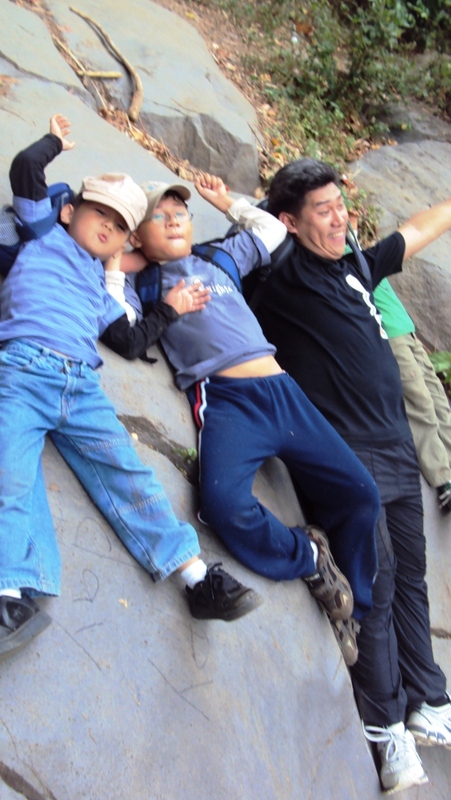 I think it’s a fun activity to do, climbing a mountain with your family. Plus there’s a sense of fulfillment when you’re able to reach the summit. Cool! Family of climbers! Your kids are impressive to be able to reach the top especially the little guy. And I think this kind of activity, as a family, would never be forgotten by ur kiddos, such an interesting bonding. Well as for me, I am not really fond of hiking since I’m scared of heights (yikes!) although I love the peacefulness when ur on the top together with cool winds and awesome scenery. But if ur boys can do it, maybe I can too. Scream, you guys are simply inspiring. Yes, I know some who do this, but not all families manage this and that’s something so genuine and very rare. 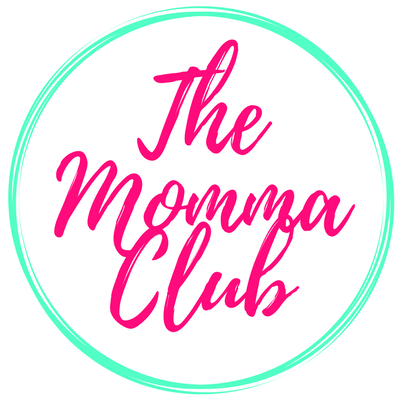 I as well love climbing mountains with friends and the tactile sensation is really something you can proud of for yourself and how much more doing it with your children or family in general? You guys are simply an example of a true family bonding. Oh! You’ve been there! It’s an hour drive away from our home. And its quite ironic, i haven’t visited Mt.Maculot yet! After too many attempts, still unsuccessful.. poor planning i guess! But maybe this summer i can come and do my first hike there with cousins! Everytime I hear of that song, I always remember my father. He loves such old songs. I find it cute for you guys to be able to conquer it as one. You sure are lucky enough. It is possible that once your kids grow, you can no longer take them to such activities. I hiked around Canada just recently and I loved how families did hikes together. This is how I always envisioned my future family to be like. Then now, I see this post, all the more I want to expose my future children in this kind of environment.